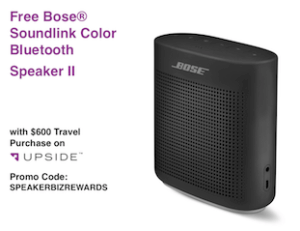 Free Bose Soundlink II Bluetooth Speaker! Free with travel purchase of $600 or more at Upside.com. For New users. Valid on hotel flight car rental and/or Uber. Flights only are OK! OFFER EXTENDED! 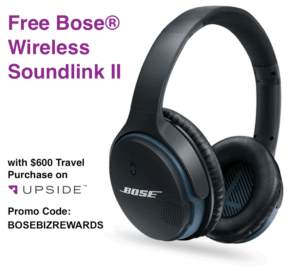 Free Bose Soundlink II Wireless Headphones when you spend $600 or more on travel at Upside.com. These sell for $229 on Amazon! Valid for first time business traveler customers only. After you purchase $600 or more for travel on Upside.com. New users only. Valid for hotel flight car rental and/or Uber. Flights only are OK! 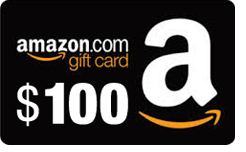 Get $100 Amazon Gift Card after you spend $400 for travel on Upside.com. Valid for all new users. Works for hotel, flight, and/or Uber (or just for flights only)! 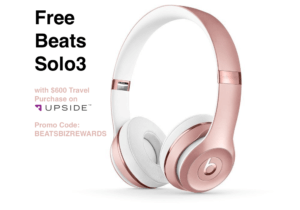 Free Beats Solo3 Wireless Headphones when you spend $600 or more on travel at Upside.com. Value of Beats Solo3 headphones is $299. Valid for first time business traveler customers only. Promo Code offer extended until the end of November! Get free $200 Gift Card (Amazon or many other stores) with min spend of $400 on flights, hotels, and/or Uber on UPSIDE.COM. This is an incredible deal!